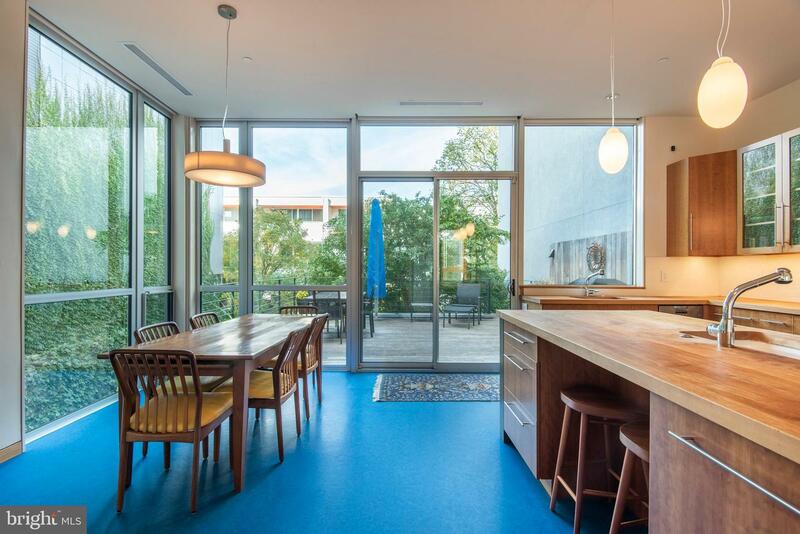 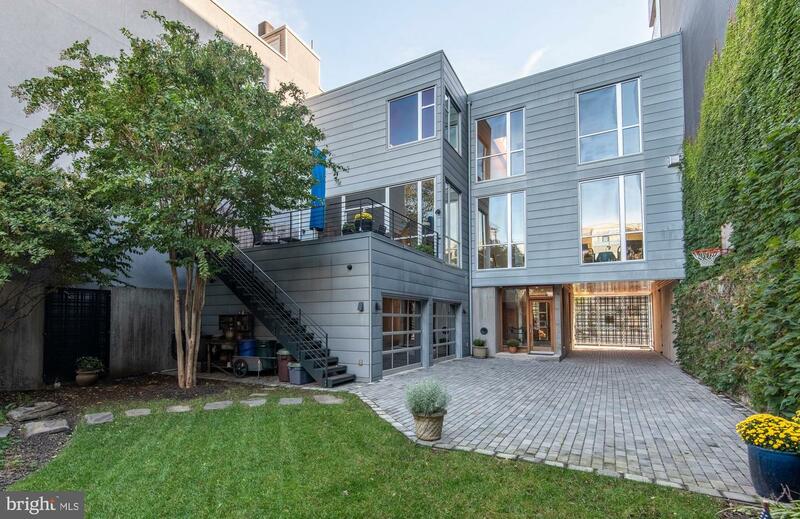 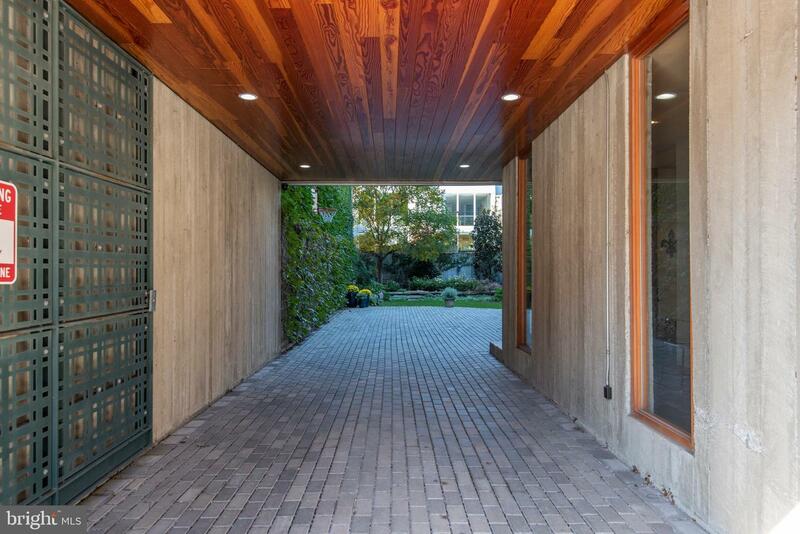 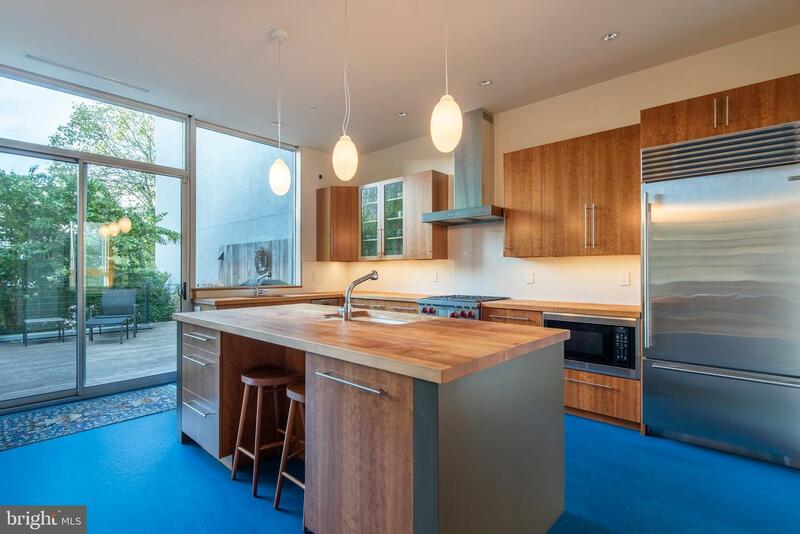 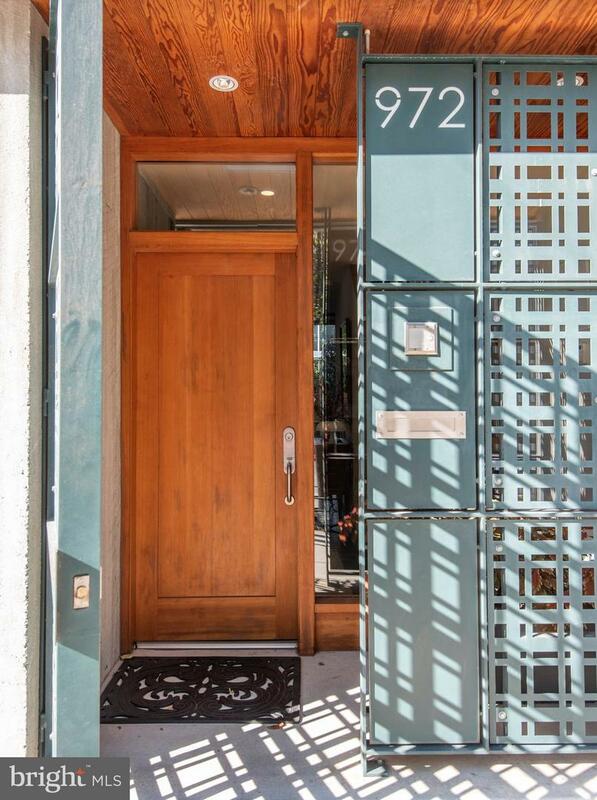 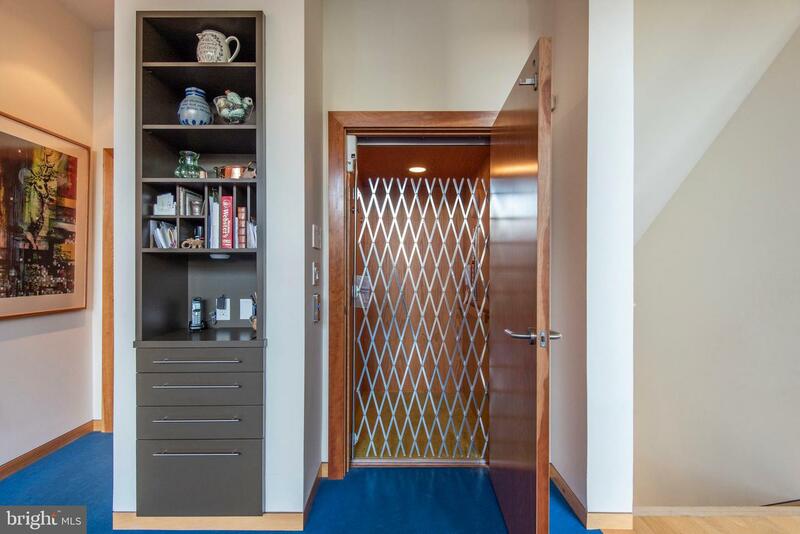 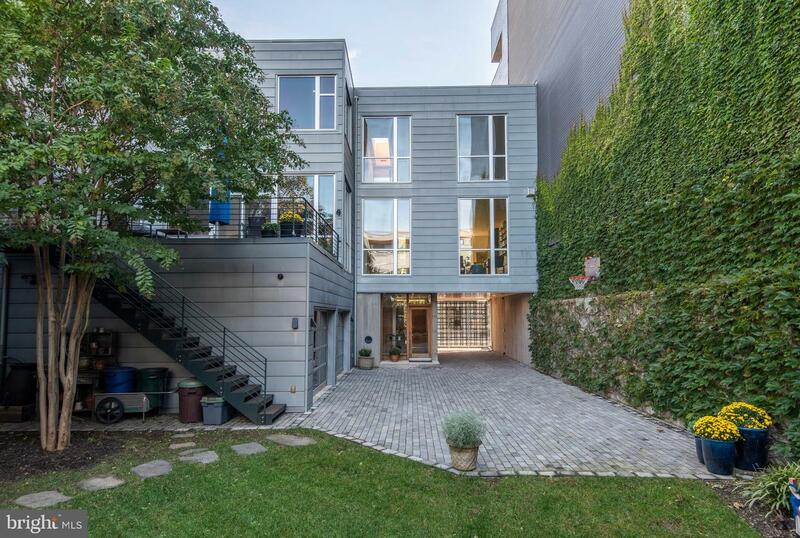 This custom townhouse is unique - designed by AOS Architects for a 45x100 lot with a contemporary exterior and an expansive 4400+ sf of living space. 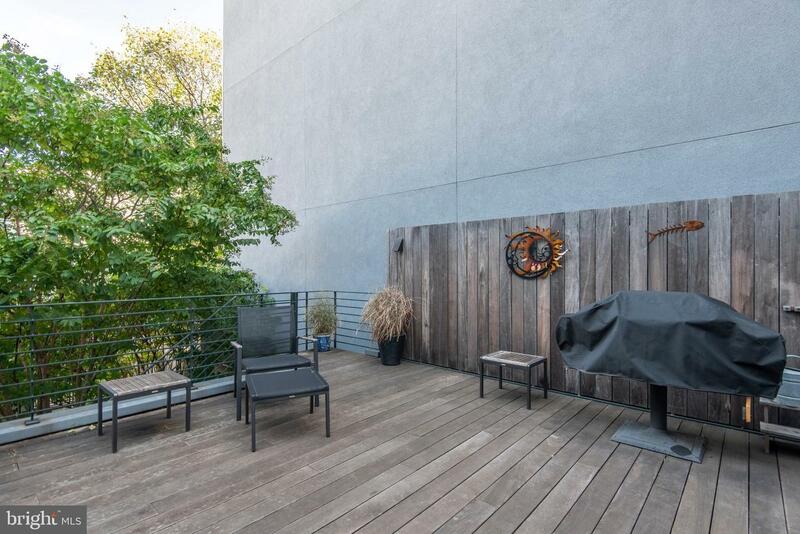 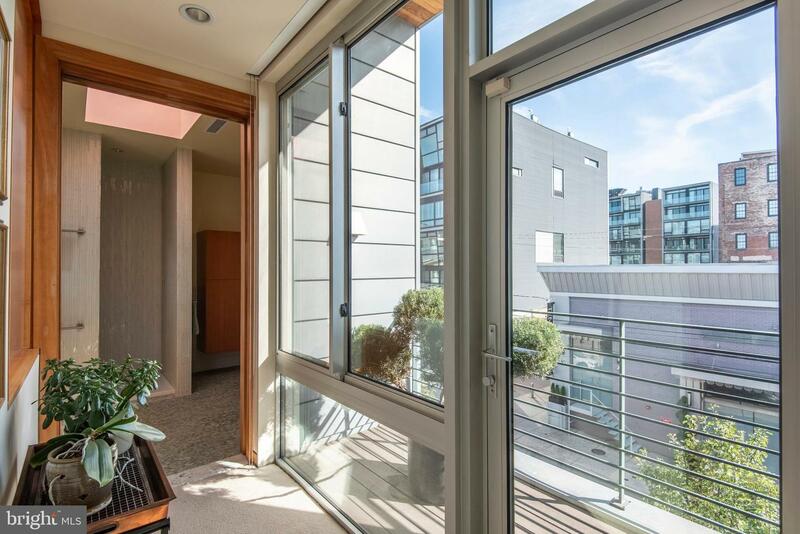 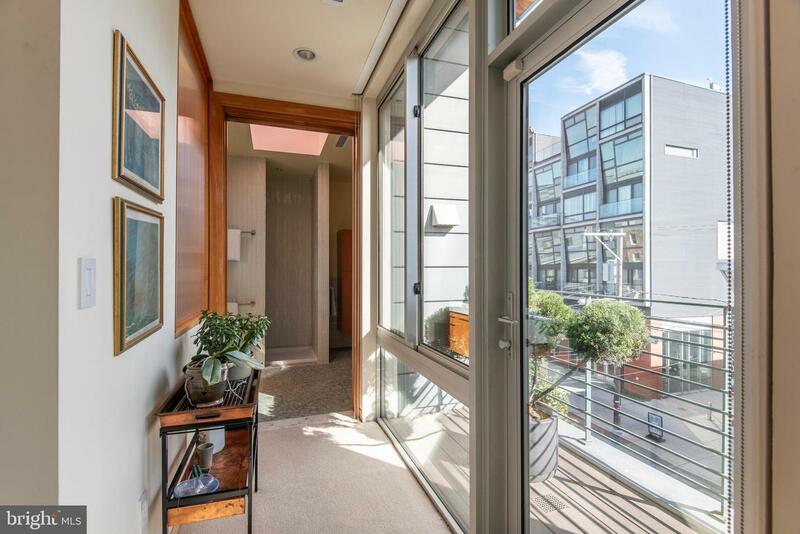 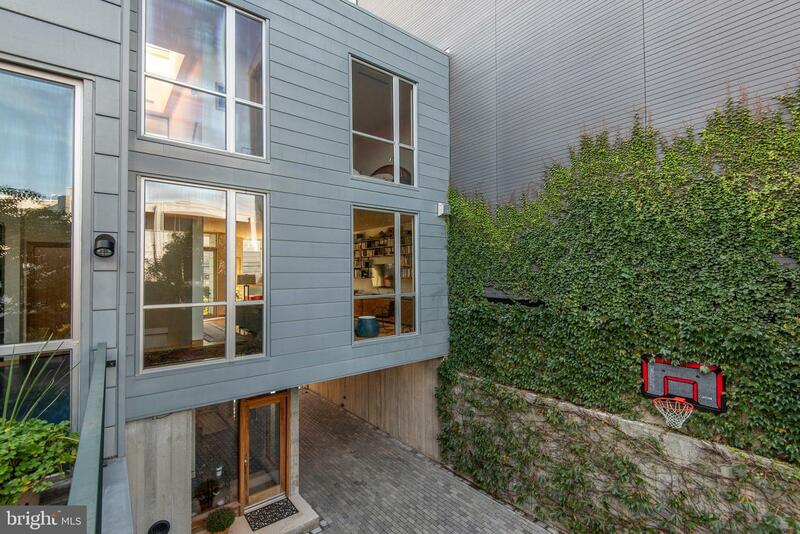 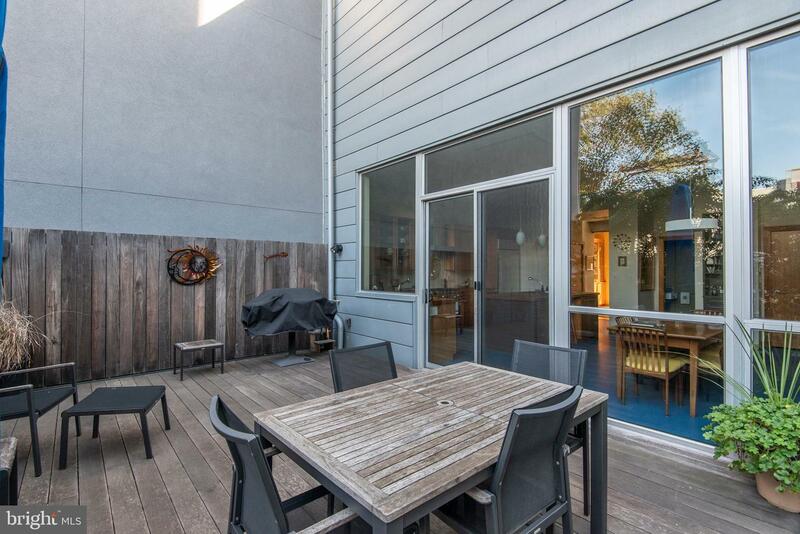 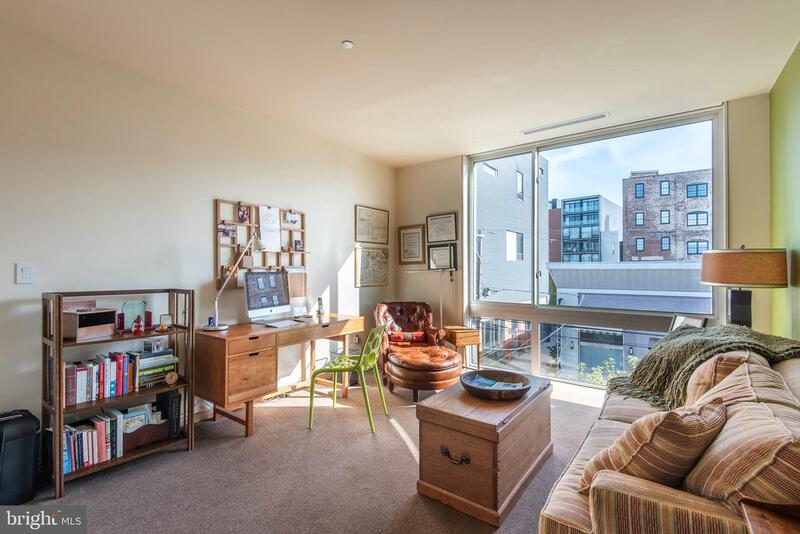 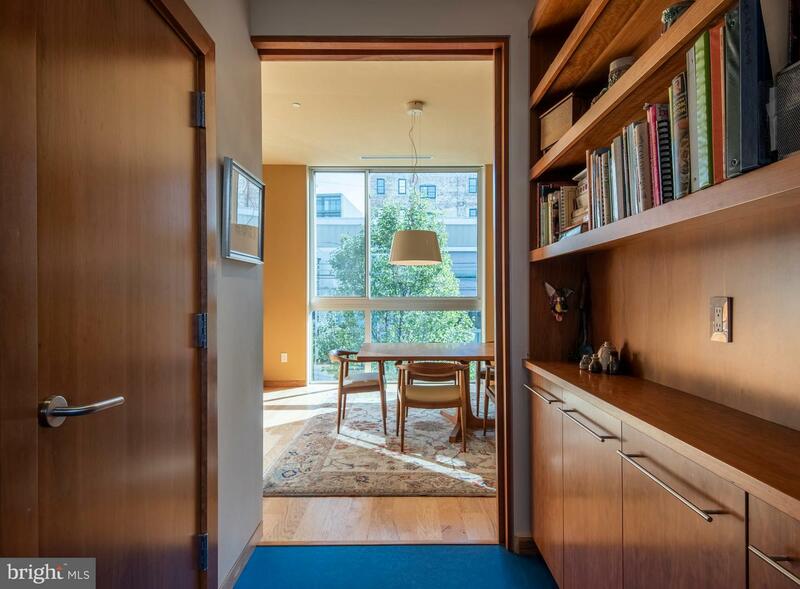 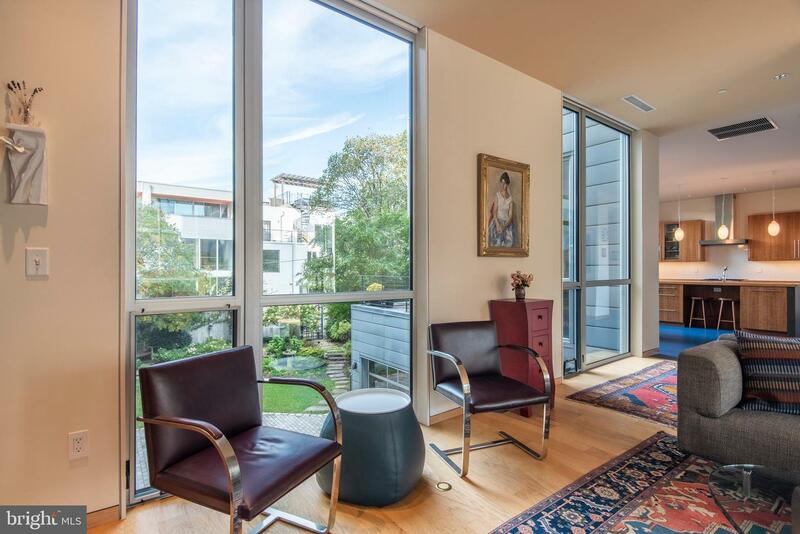 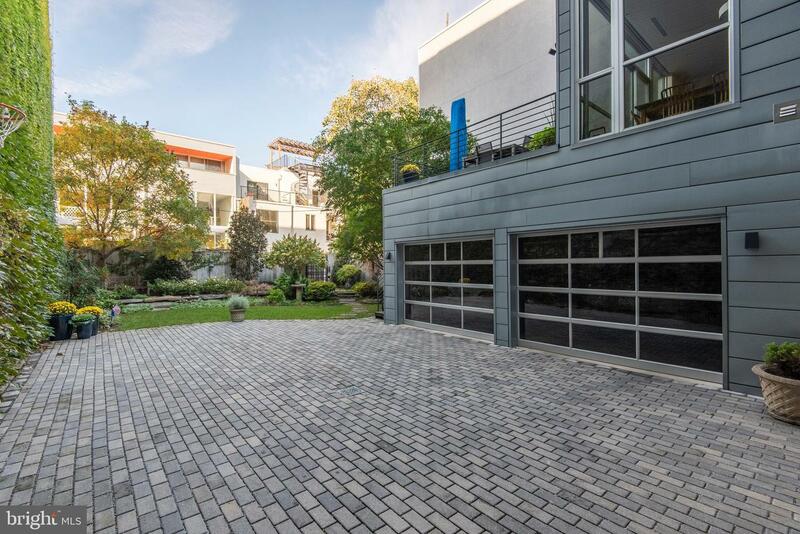 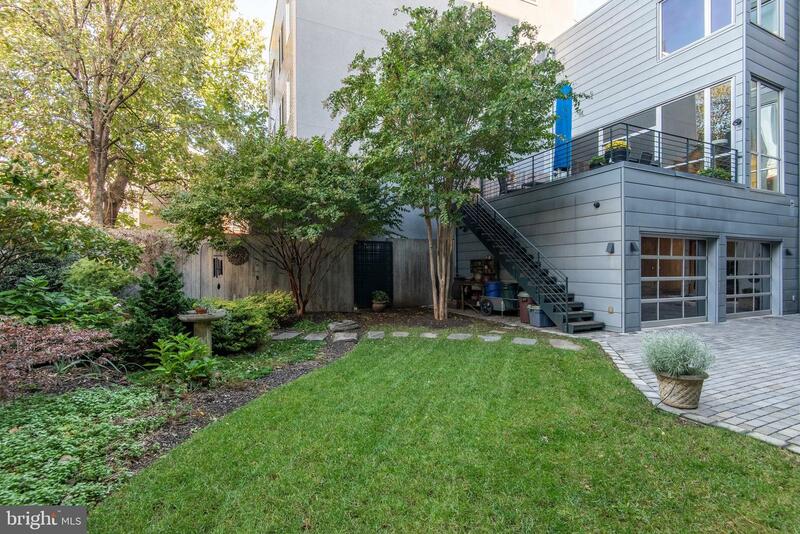 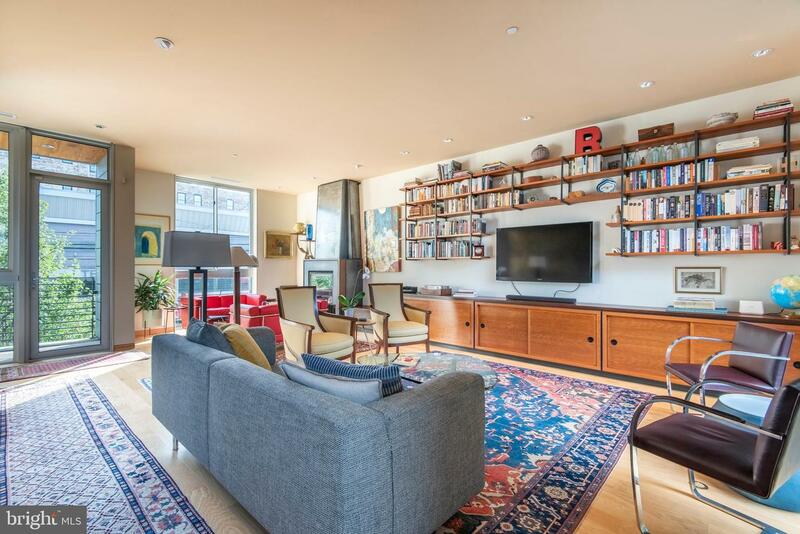 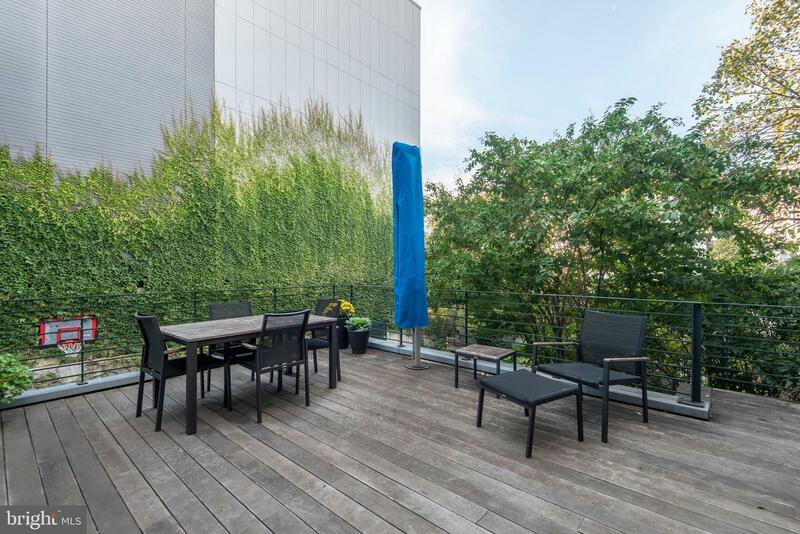 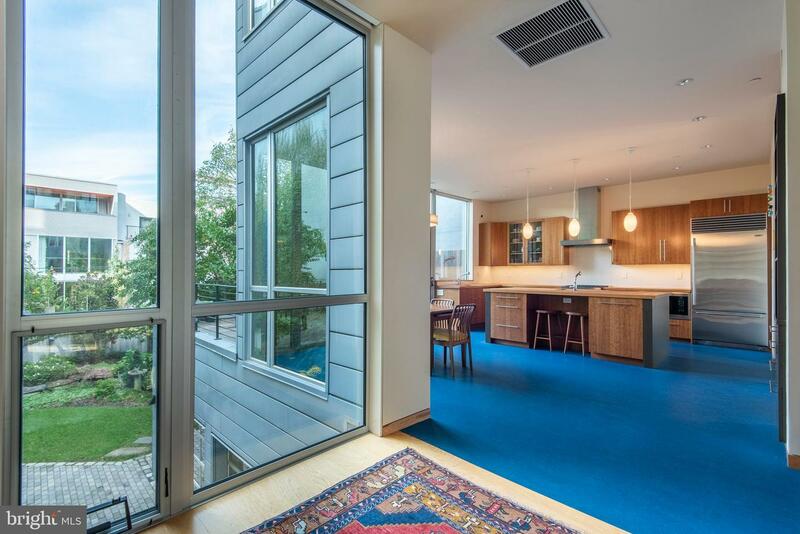 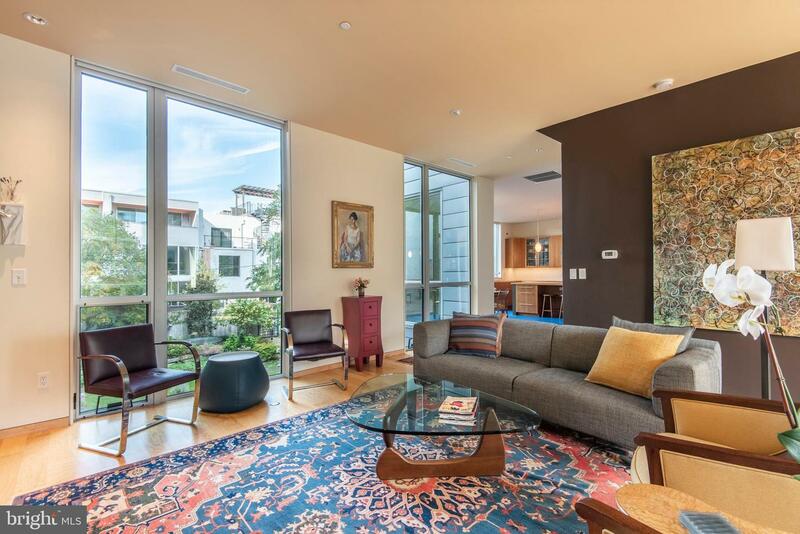 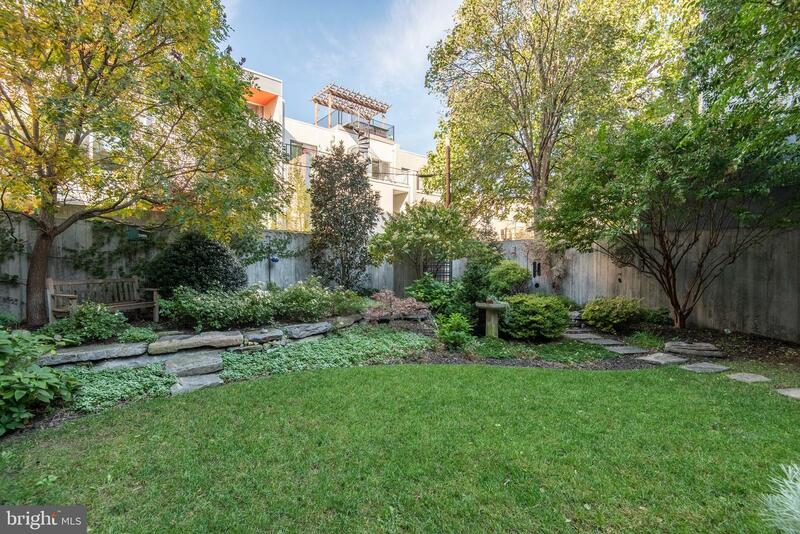 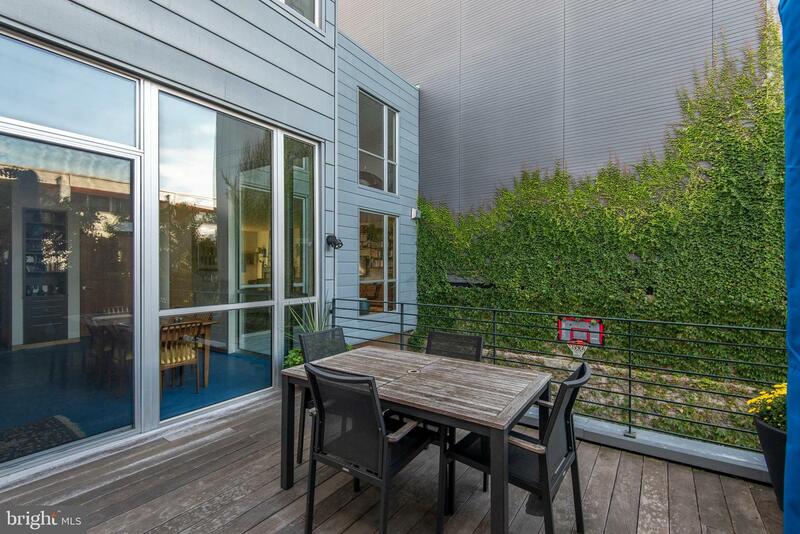 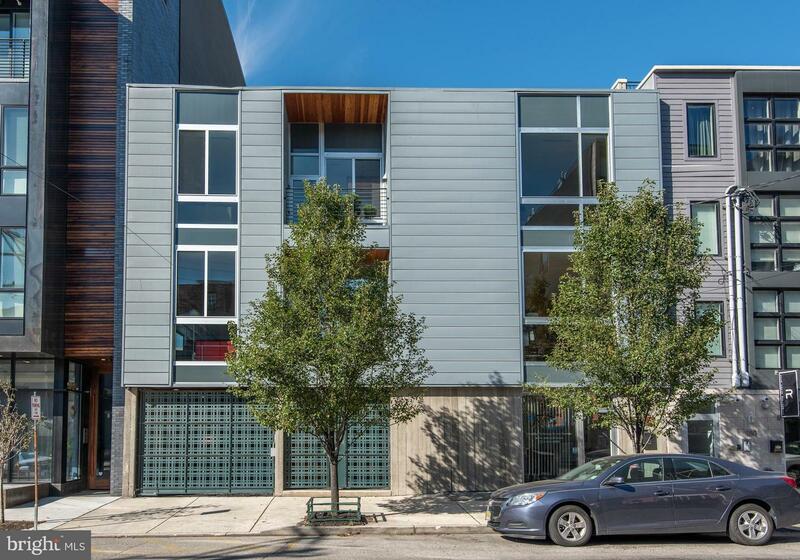 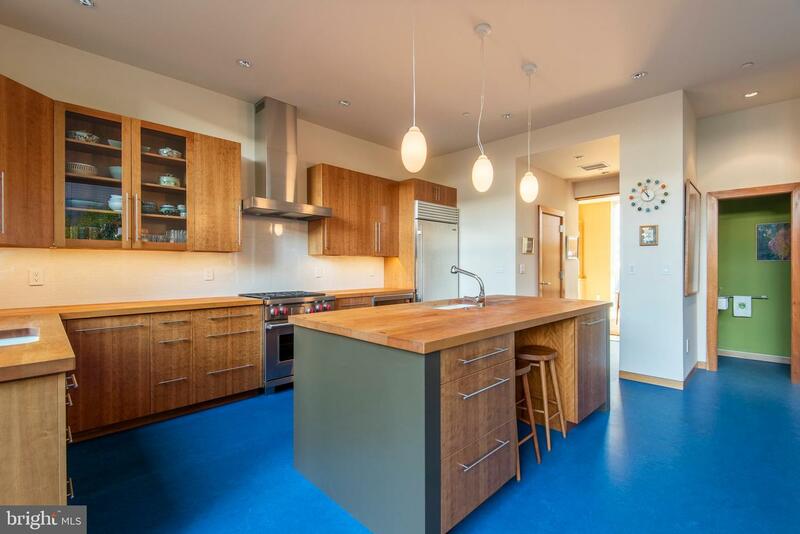 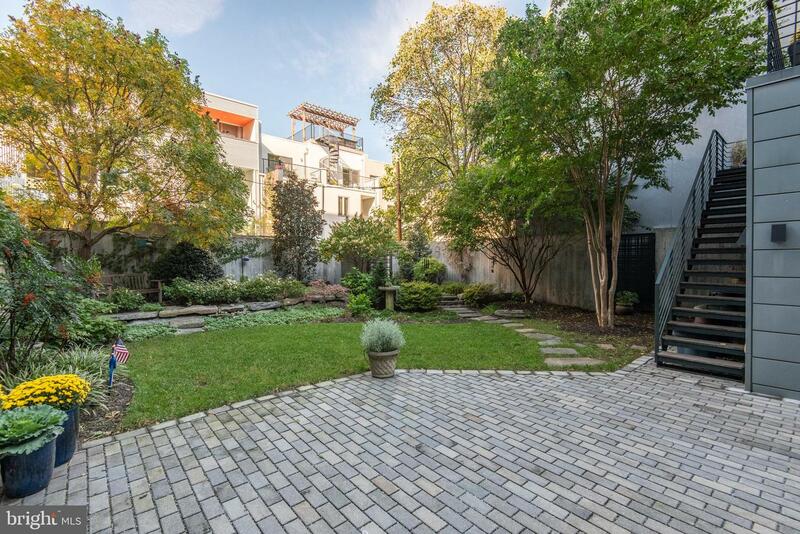 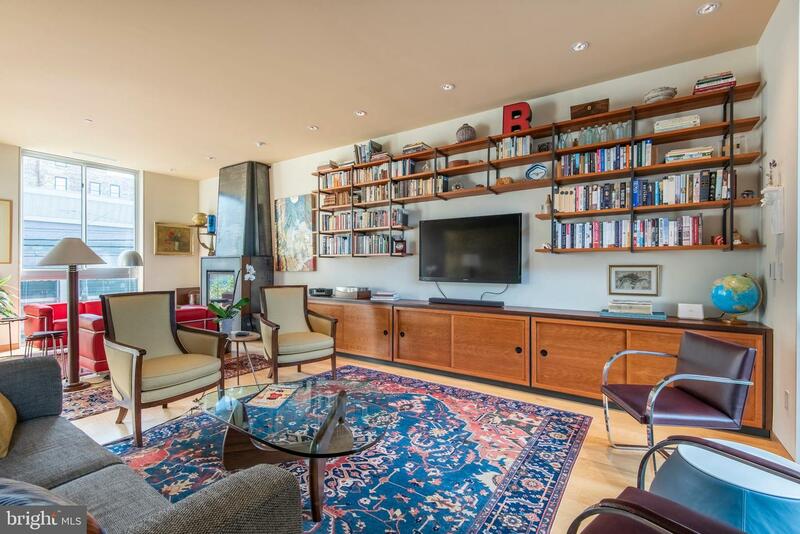 Its private garden, courtyard parking, plus two-car attached garage are unheard of in the city. 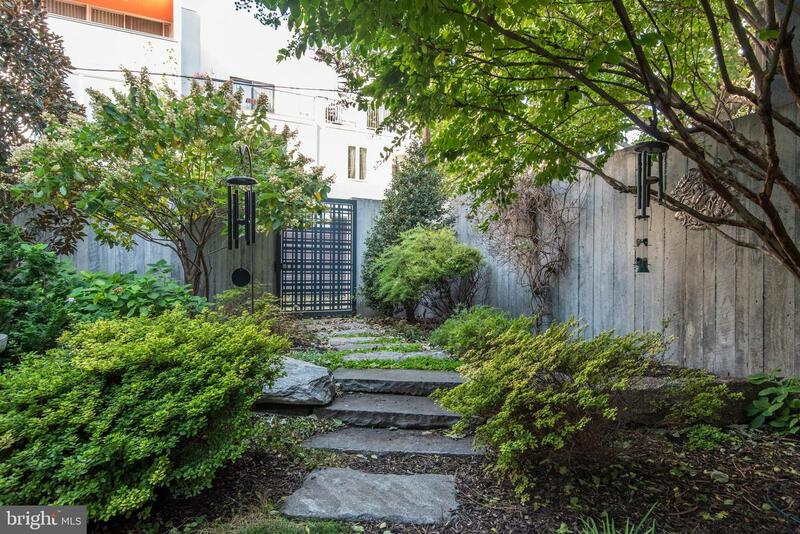 The rear yard is a landscaped quiet space with mature plantings and the security and privacy of an 8ft concrete fence with gated alley access to nearby Liberty Lands park. 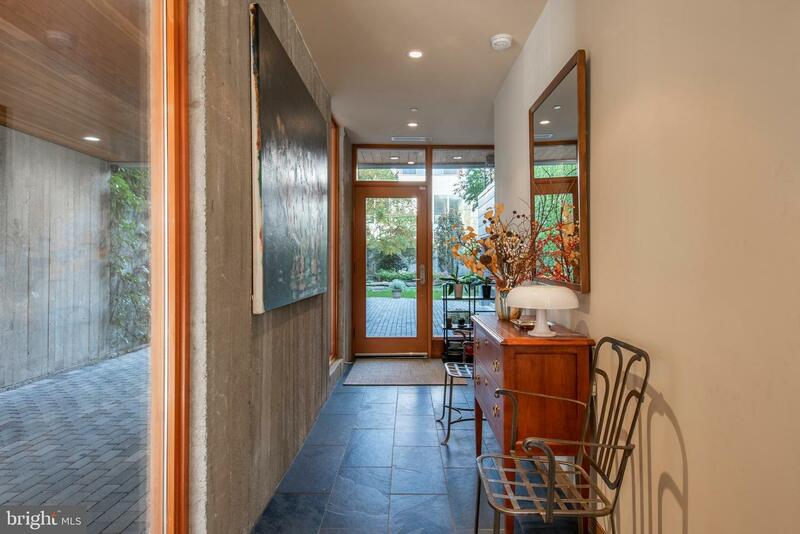 The ground floor natural slate entry area includes a coat closet, garage access, powder room, and laundry room. 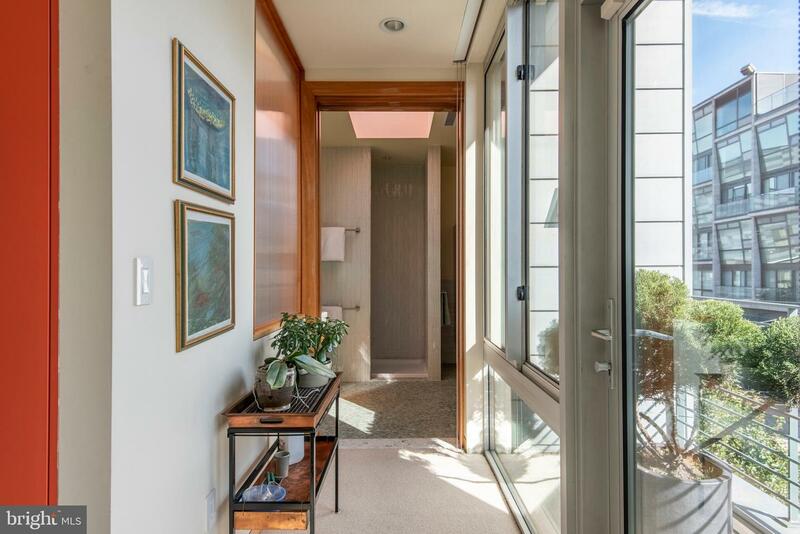 Take the elevator or front stairs up to a magnificent living space with 10ft ceilings, floor-to-ceiling windows with power shades, two separate seating areas, custom gas fireplace, and wall of custom shelves. 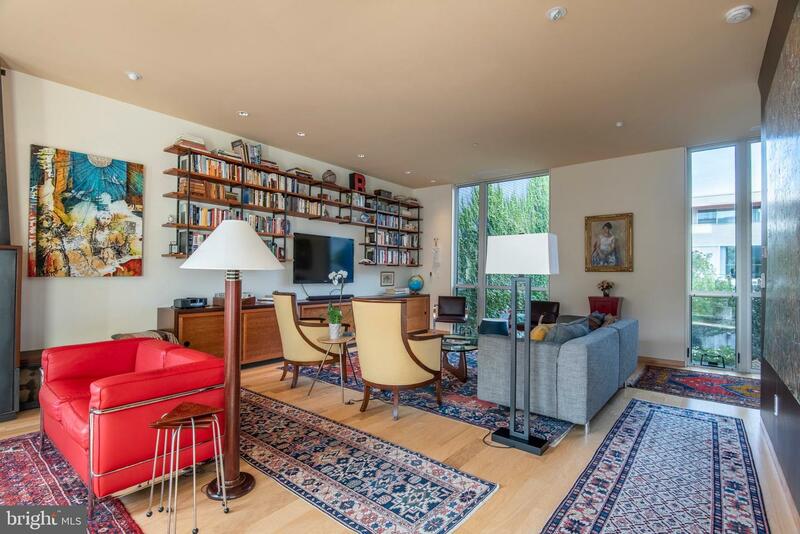 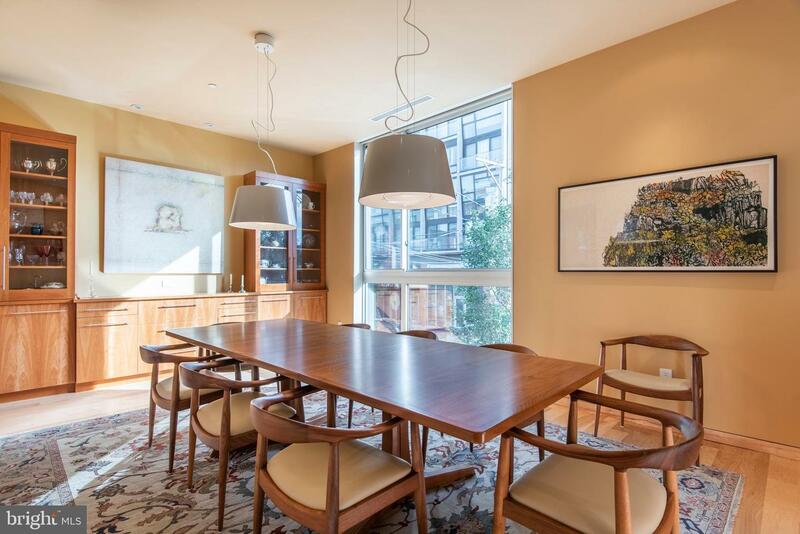 A stately, oversized dining room and kitchen plus powder room and balcony occupy the other half of this floor. 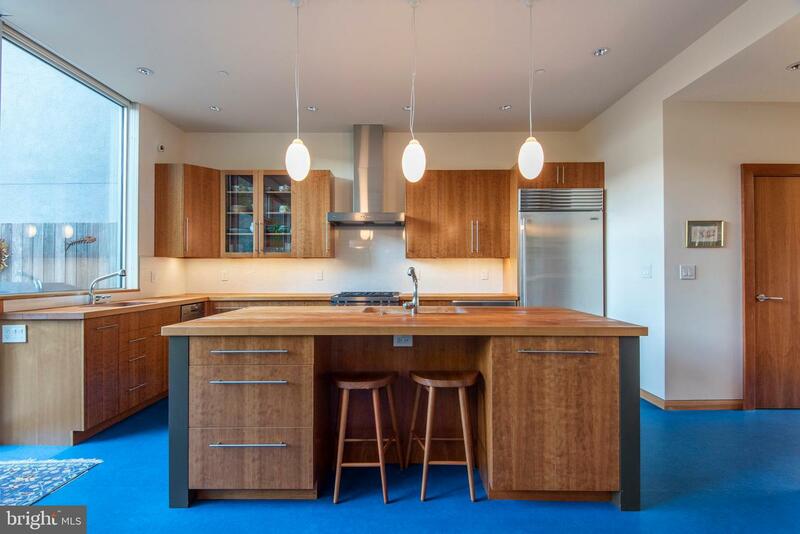 The Kitchen and dining room feature cherry cabinetry by Pappajohn with high-end appliances - SubZero fridge, Wolf stove and microwave, Dacor warming drawer, and two Miele dishwashers - along with eat-in space that faces onto a spacious 16'x20' IPE mahogany deck with stairs to the backyard. 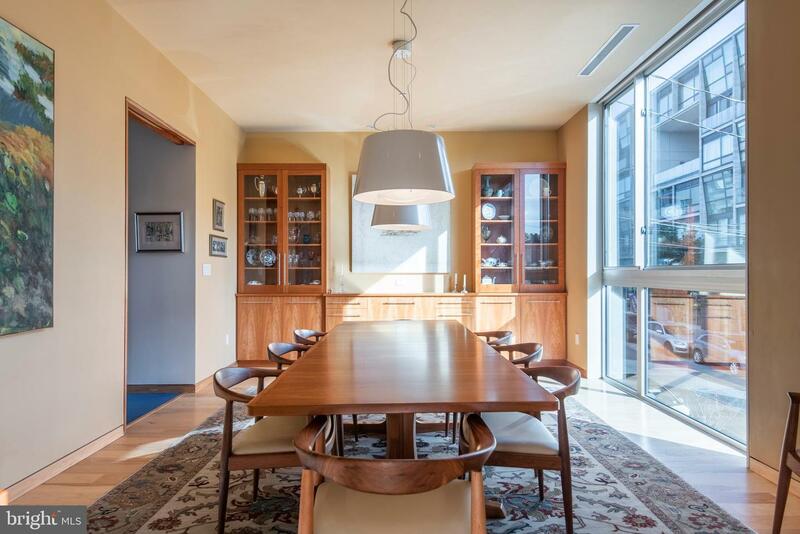 The dining room includes cabinetry at either end with a wet bar, under-cabinet fridge, and wine rack. 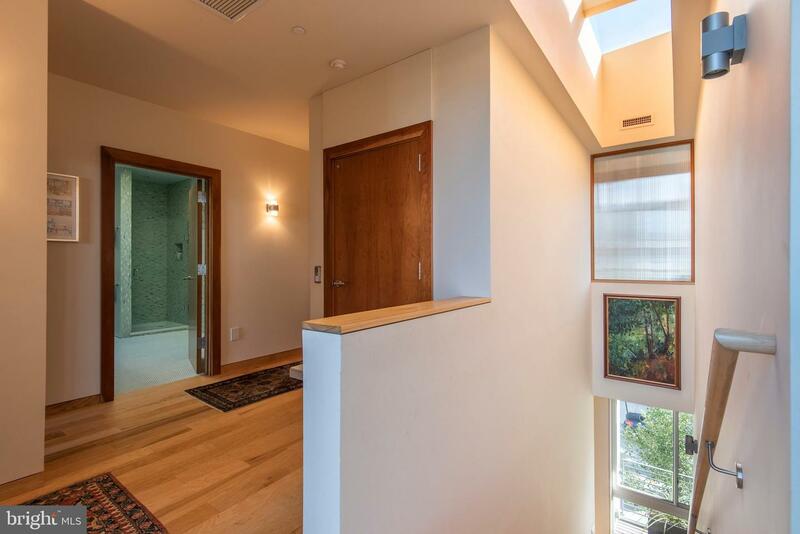 There are three bedrooms and two bathrooms on the third floor with 9ft ceilings. 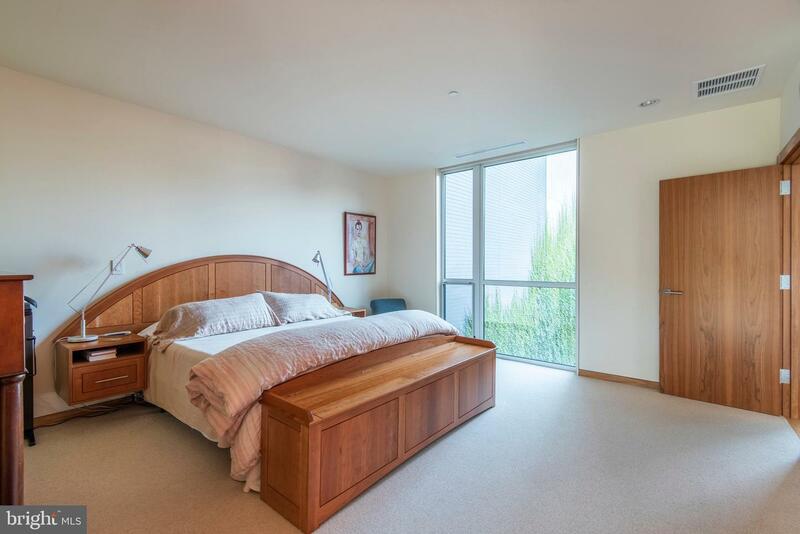 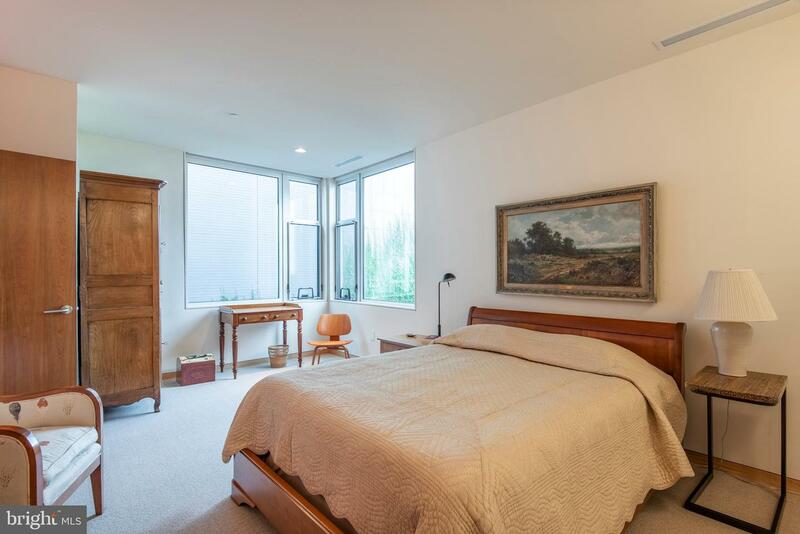 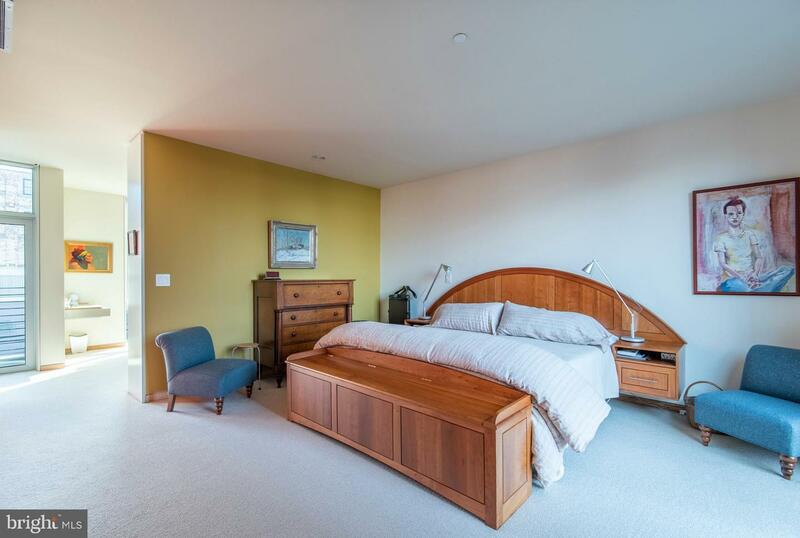 The master bedroom has a separate sitting room with custom built-in desk, gas fireplace and another balcony. 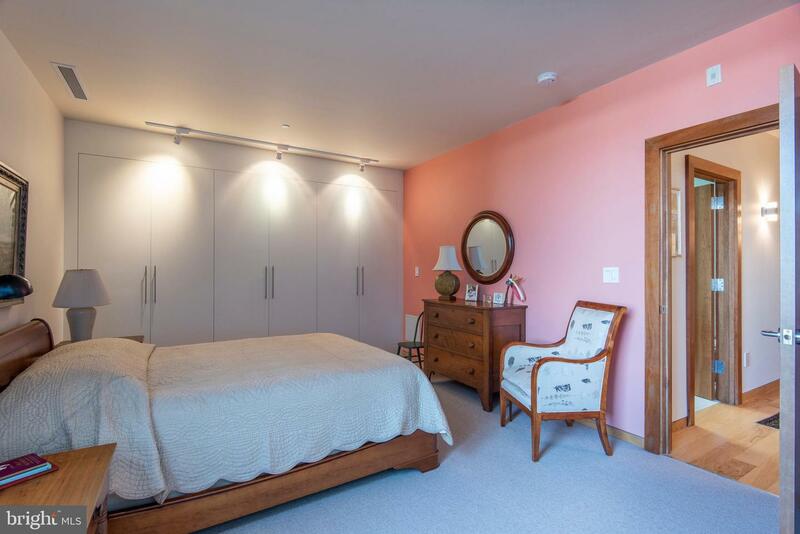 All three bedrooms have generous closets with built-ins. 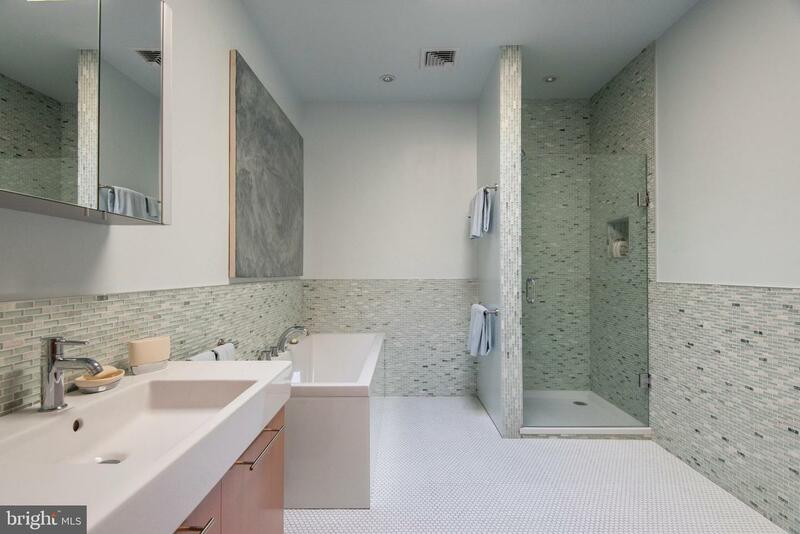 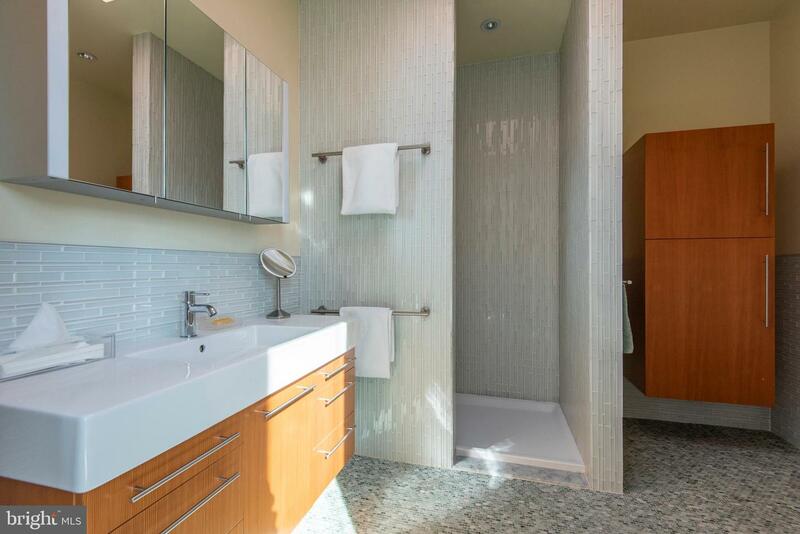 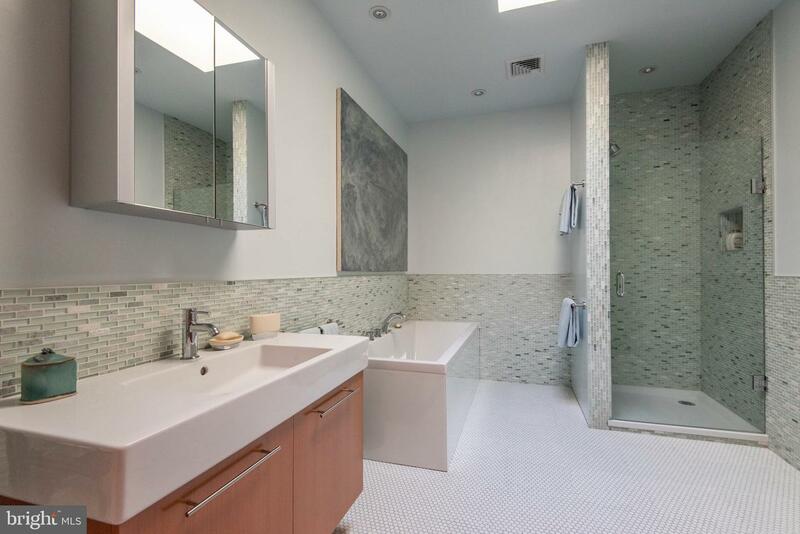 The bathrooms are large with designer glass tile, Duravit fixtures, and Hansgrohe faucets. 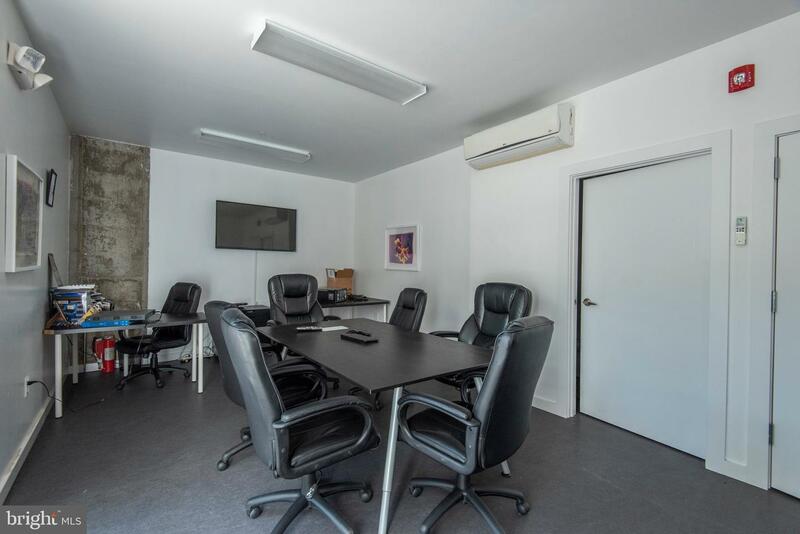 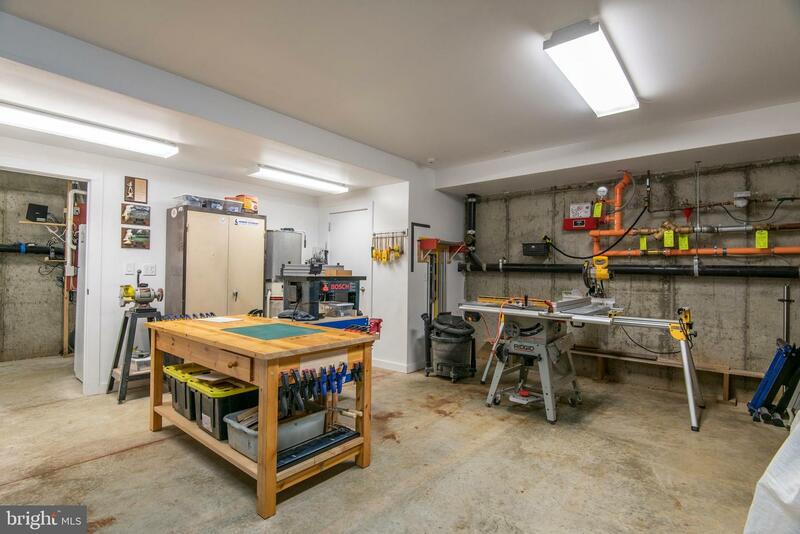 Special features include a central vacuum, intercom system, security cameras, fire sprinkler protection, lawn irrigation system, a basement with an 8ft ceiling, and an office rental space on the ground level providing passive income. 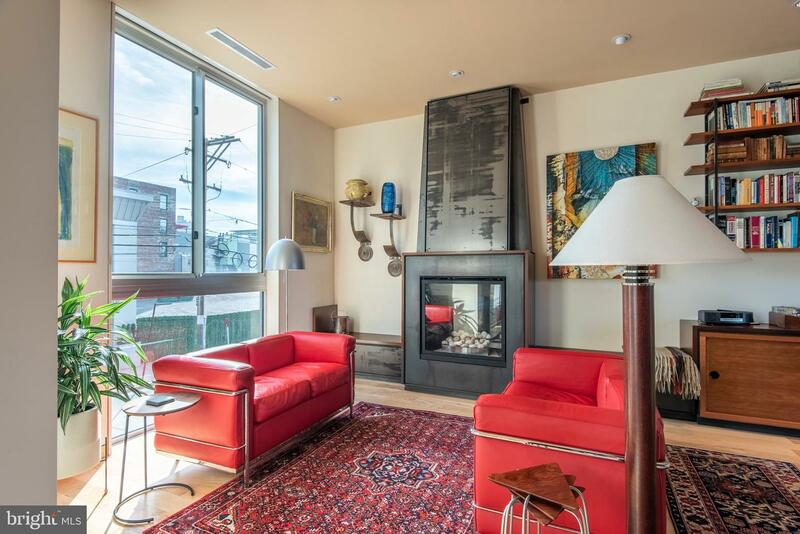 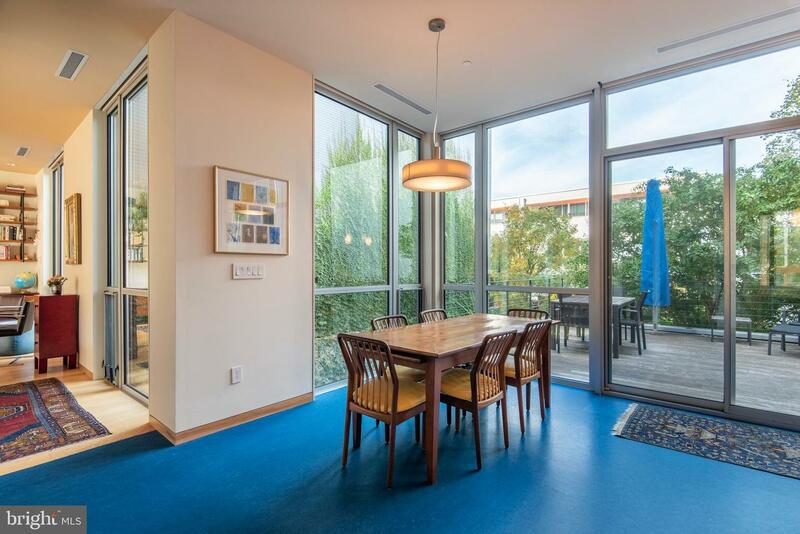 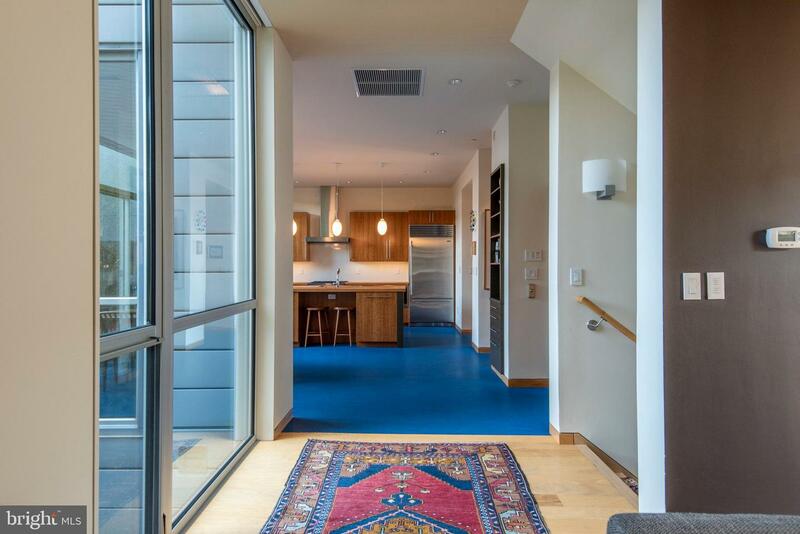 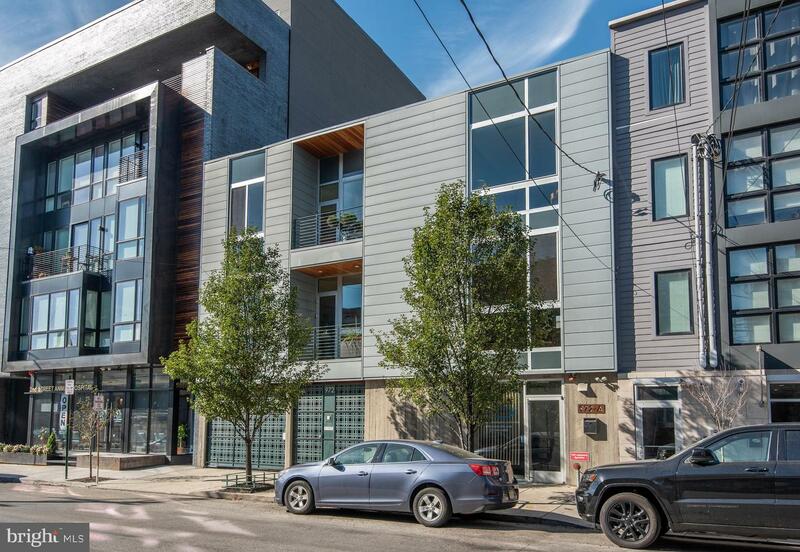 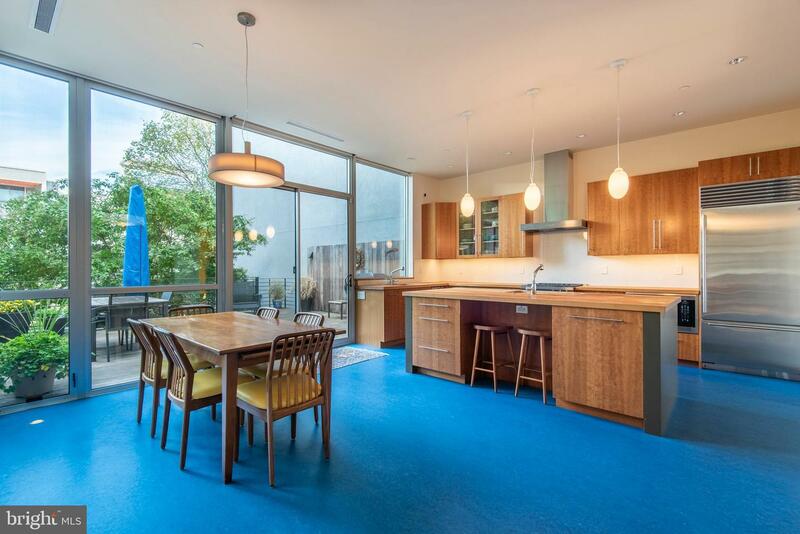 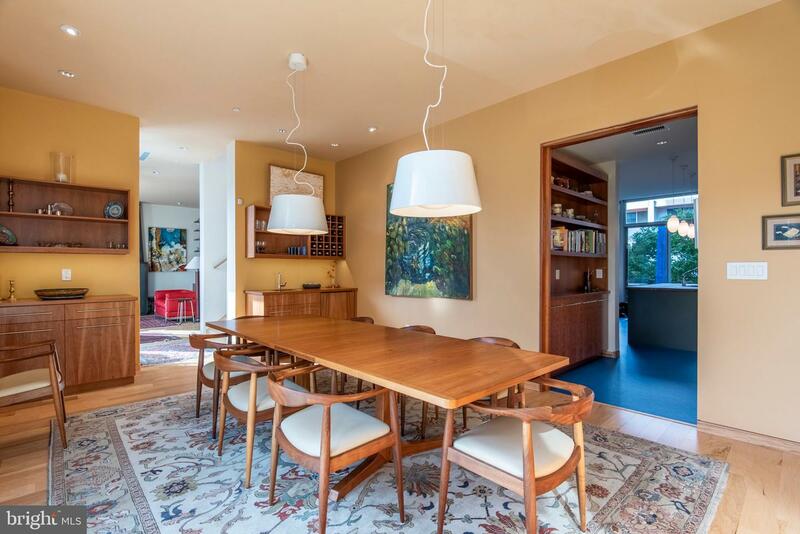 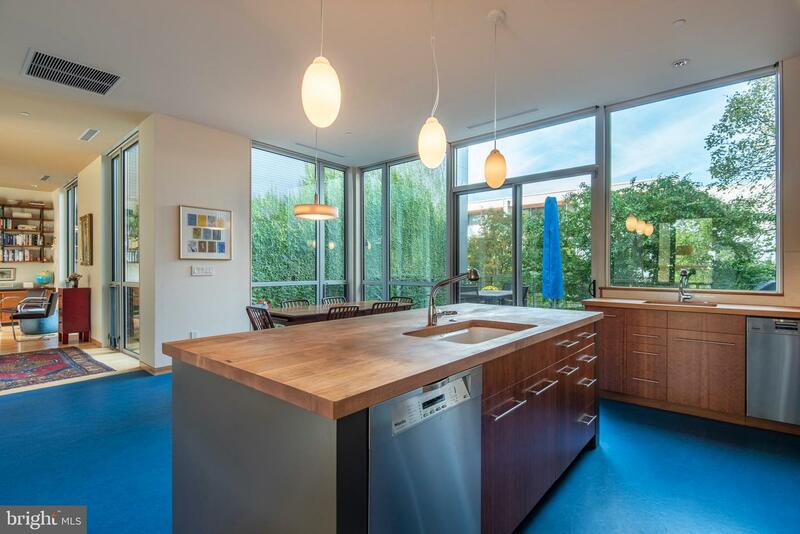 The thriving social scene of Northern Liberties surrounds this remarkable home with walkable dining in some of the best Philadelphia restaurants. 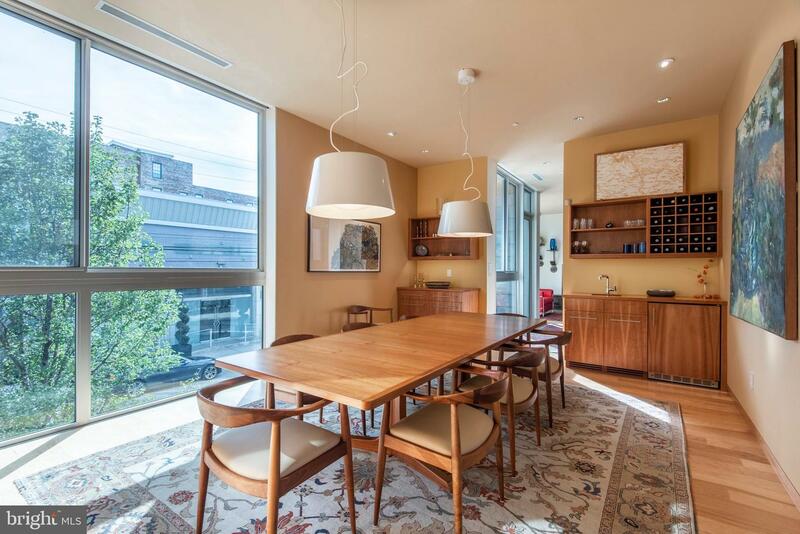 Cafes, coffee, and neighborhood bars are nearby. 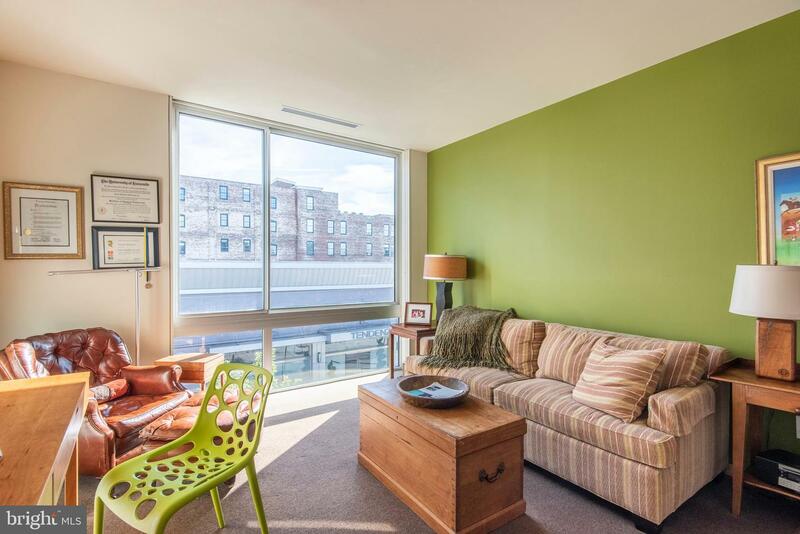 Easy access to Center City, the Philadelphia airport, and the sports stadium area. 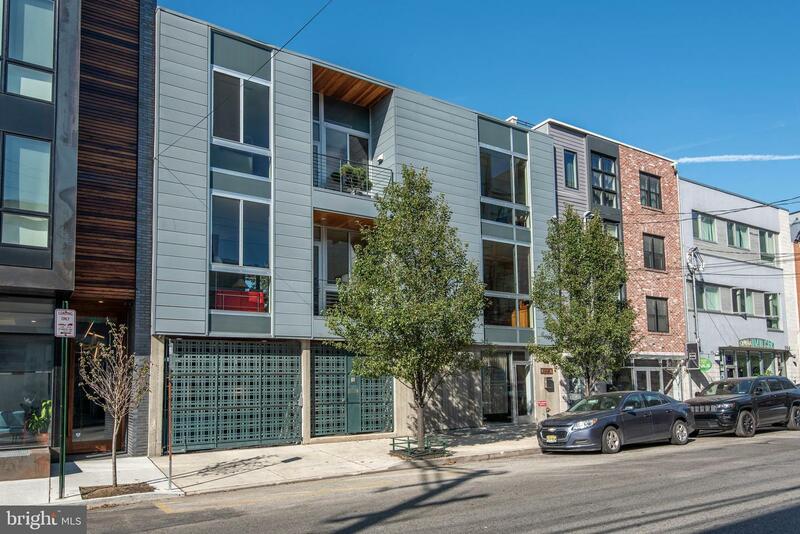 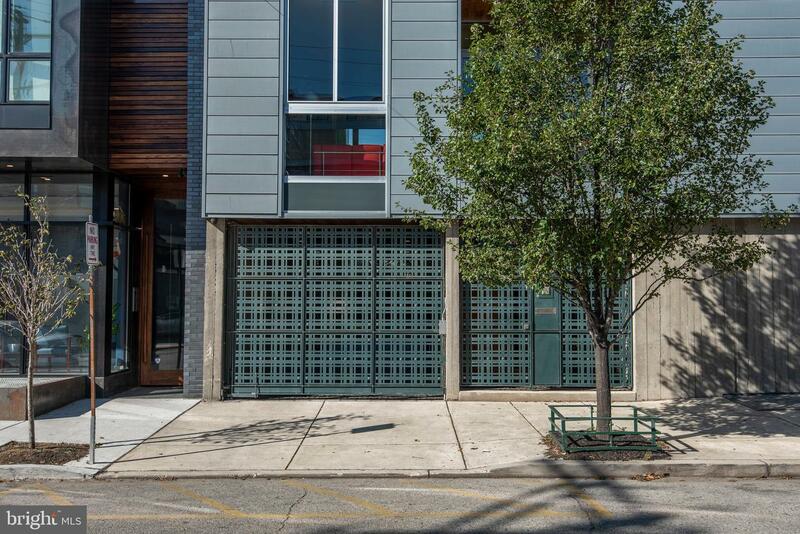 This is a home built for its Philadelphia setting - and for its owners to embrace the Northern Liberties life.